Chandler played halfback in college and also punted with distinction, averaging 44.3 yards as a senior to lead all major schools. He was chosen by the Giants in the fifth round of the 1956 NFL draft and became the team’s punter, averaging 41.9 yards on 59 kicks. Giants went 7-5 to finish second in the NFL Eastern Conference. Chandler, who averaged 44.0 yards on a league-leading 65 punts in 1958, remained with the Giants through 1964, a total of nine seasons. He added placekicking to his responsibilities in 1962, achieving career highs with 19 field goals and a 67.9 percentage of success. Chandler led the NFL in scoring in ’63 as he booted 18 field goals and 52 extra points for a total of 106 points. He was an All-Eastern Conference selection by The Sporting News as a punter in 1964, having averaged 45.6 yards on 73 punts, although his field goal accuracy dropped off. With the Giants, Chandler was successful on 46 of 78 field goal attempts (59.0 %) and added 131 extra points out of 138 attempts for a total of 269 points. He averaged 43.8 yards on 525 punts, making him the franchise leader in that category. Chandler was traded to Green Bay in 1965 and continued to handle both placekicking and punting in his first two years with the championship-winning club, receiving All-Western Conference honors from The Sporting News as a placekicker in ‘65. 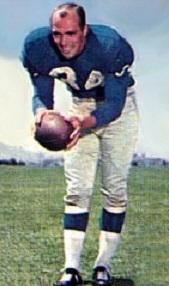 Chandler gave up the punting duties in 1967 and tied his career-best with 19 field goals and was named to the Pro Bowl in addition to receiving all-conference honors. He capped his career with four field goals, in as many attempts, in the Super Bowl II win over the Raiders. For his career, Chandler booted 94 field goals in 161 tries (58.4 %), was successful on 248 of 258 extra points, and averaged 43.5 yards on 660 punts. He was chosen to one Pro Bowl and was a three-time all-conference selection of The Sporting News.